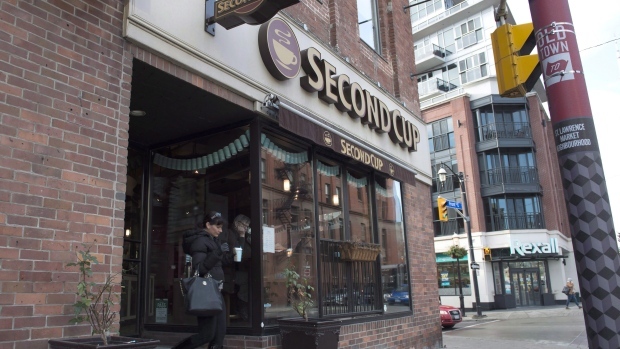 Second Cup Ltd. has identified more than 20 Ontario locations that it hopes to convert into pot shops as the coffee chain undergoes a strategic review, according to its chief executive officer. Through a joint venture with National Access Cannabis Corp., Second Cup is already planning to convert two of its Alberta locations into cannabis stores and hopes to open several more in Ontario, where the government will start accepting applications in December. For now, marijuana sales in Canada’s most-populous province are limited to a government-run website, with the first stores expected to open in April. “As regulations are not yet finalized in Ontario, we do not know the number of potential dispensaries for us, but we have more than 20 locations identified for potential conversion,” CEO Garry Macdonald said in an email. Second Cup, formed in 1975 and now with 270 stores across Canada, has been struggling with declining revenue and profits amid fierce competition from Starbucks Corp., Tim Hortons Inc. and McDonald’s Corp. However, it improved its cash position to $14.1 million in the third quarter from $3.3 million a year earlier, with no debt. Second Cup, based in Mississauga, Ont., has jumped 24 per cent this year to $2.70, boosting its market value to about $54 million. Ottawa-based National Access Cannabis has medical clinics in six provinces and recreational stores in Alberta and Manitoba.